So much of modern advertising is meant to prey on our deepest insecurities, but one amazing marketing team is offering consumers a breath of fresh air with an inspiring message of body positivity: Dove just released a new ad reminding women that they’re so beautiful they could probably drop out of school and just rely on their looks from here on out. This. Is. Awesome. It’s so refreshing to see a beauty company spreading an inclusive, body-positive message like this one! 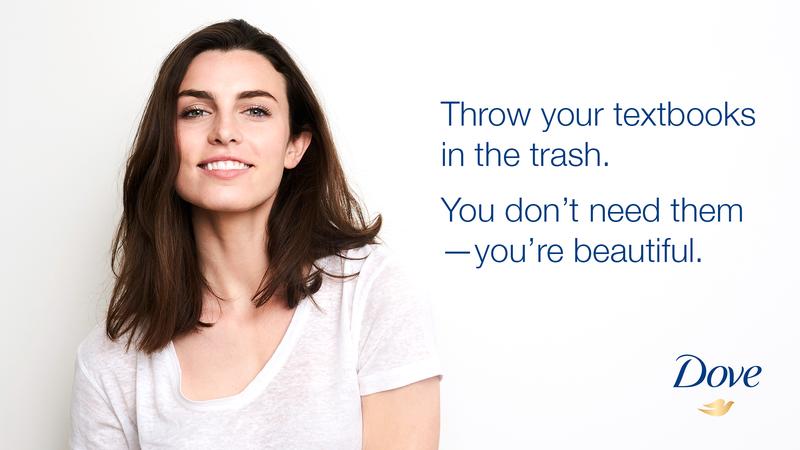 Yesterday morning, Dove released a new series of ads proudly declaring that women of all shapes and sizes have the beauty they need to throw their textbooks in the dumpster and coast through life on the strength of their looks alone. In one of the powerful TV spots, dozens of real, un-airbrushed women smile at the camera while a voiceover announces that all of them are beautiful enough to flutter their eyelashes at a rich guy and let him sweep them away from any of the tough math problems or dense historical texts they might be studying. A lesser company would have told women they need to buy their product to be beautiful, but Dove has rejected that harmful messaging to remind women everywhere that they already possess the dazzling good looks necessary to seduce a millionaire and spend their days lounging by an infinity pool rather than slaving away at a desk job. Preach, Dove! This is the kind of uplifting affirmation so many women desperately needed to hear. Wow. It’s safe to say that Dove has absolutely knocked it out of the park with this one. Here’s hoping more companies will follow their lead and use their ads to build women up instead of tearing them down!